Okay, so this was my day. I got off work and ran some errands (and in the process got a killer new split-end leave-in treatment), then went home and discovered my doctor’s appt was not covered under insurance so I stayed on the phone with Aetna for 35 minutes fixing that mistake. Afterwards, I worked out, and made some nice jalepeno popper chicken (recipe tomorrow), and decided to be really awesome and clean my fish tank. A simple water change. Cause I’m so wonderful. I’m not wonderful. Somehow in the process of doing a simple 30% water change I introduced a deadly and swift enemy. This enemy is still unknown, and sadly there were four casualties. 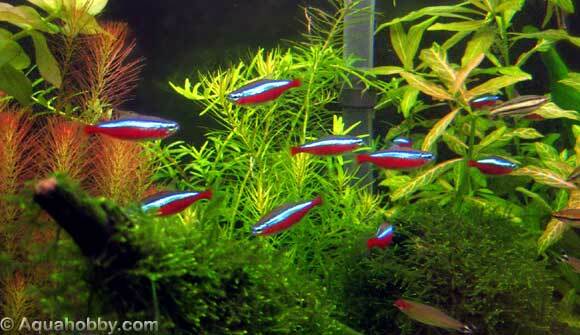 My lovely and sweet cardinal tetras (photo below is not aquarium… cause sadly I barely have any fish in there) died. Within 30 minutes of the water change. At least the death was quick and painless (I hope). I digress. Luckily, my ottos survived and the water is more or less clean. I went to my local sea/fresh water pet store and they double checked my water levels… and it was all good. All clear. I just have to say, I’ve never felt so helpless than being away from my ottos in those 45 minutes I was away. Simply awful. When I got home I had a bunch of solutions to my problem, even one that was on the back burner for a while (my plants), and advice on how to proceed. I decided to share with you all, all those fishie lovers out there, that if this happens to you- don’t panic, and follow these rules, if the following applies to you. I cleaned and moved around the gravel and noticed when the fish died that little white worms were in the water- and I thought “on no! they got my fish! Bastaaaards”. The wormy things are planeria, and are harmless. If anything they break down the gravel bacteria. (see, it’s still a mystery of what killed my fish). Check your water for nitrite, nitrate, and ammonia. 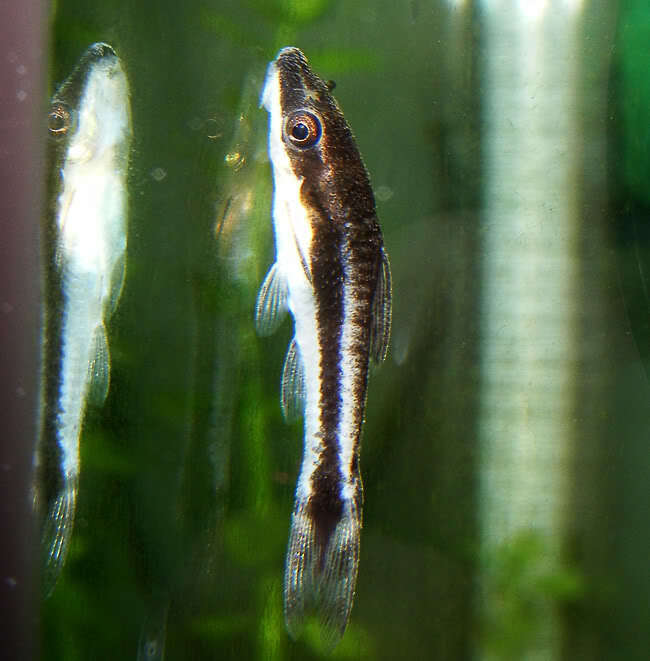 Check if your temp is too high or too low (the shock of the change usually kills all fish unless the tank is over 30 gal- then the change is less noticeable and is mildly irritating to fishies). 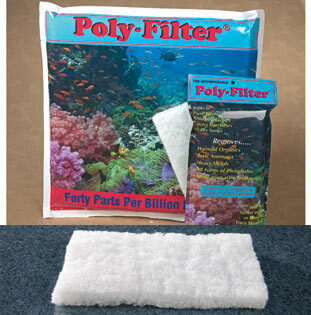 Add a poly-filter to your filter medium (this will help remove ANY additional toxins, irritants, bacteria that’s not good,etc in ONE week). Cut this baby to size to fit into your filter. Toss poly-filter in a week and note it’s color. whatever the color that’s what the problem was. Add in SeaChem Stability (or similar) every other day in half doses for about 3-4 days for the good bacteria in it. DON’T ADD ANY NEW FISH, FOR THE LOVE OF GOD, just don’t. I have live plans in my aquarium, and for a while they flourished. So did my algae. That’s why I got the ottos. Then, they started to die out, like the leaves would slowly disintegrate, one by one. I used Excel 3 times a week (to regulate the algae problem). Apparently, my water was too clean (oddly, cause I do water changes about once every 3 months) and therefore the plants were starving. How strange! But basically, I had no nutrients in the water; in order for photosynthesis to occur in a tank, the plants need potassium, iron, and small traces of phosphate and nitrate (according to the aquarium dude- he’s worked there for like 8 years). And I had none! I quickly picked up SeaChem Flourish which has all the different chemicals in varying levels to support plant growth. So lessons learned. Several of them. And although I’m going to miss my three year old carindals I’m excited at the prospect of maybe getting some new fish, aside from tetras (should my tank survive this mystery attack). Thanks for hanging in there in this “lesson of the day” sort of post. But seriously, I was bawling, I take fish seriously. This was traumatic, and now I’ve got a plan. And when there’s a plan there’s bound to be success. Posted in Thoughts and tagged aquarium, bad luck, Cardinal tetras, fish, fish care, freshwater aquarium, freshwater tank, how-to, life lessons, Otto fish, Ottos, seachem, suggestions, tank, tetras, thoughts, troubles, week day troubles. Bookmark the permalink.